Again, simple, easy, can take it to work for lunch… perfect for our current lifestyle of… being incredible busy and stressed out, too many things to do and never enough time. 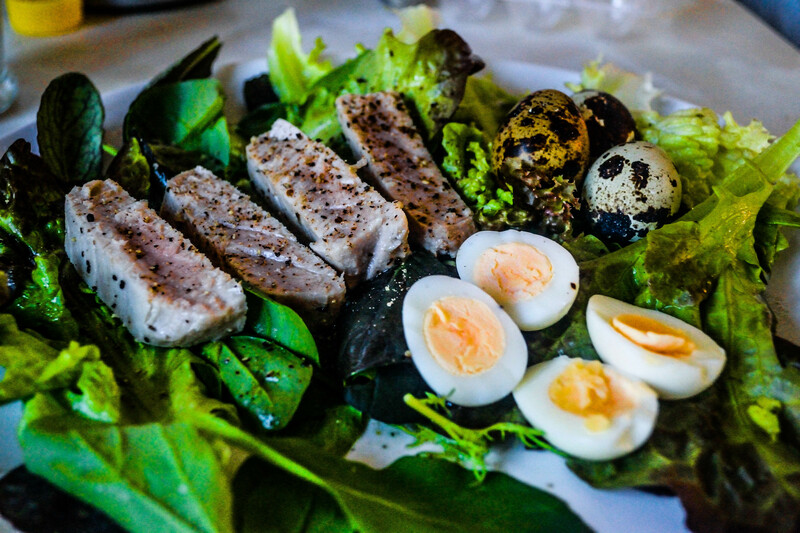 It’s a simpler and cheaper version of the Eastern Style Tuna Nicoise Salad with Tea Marbled Eggs and Wasabi Vinaigrette. Marinate the tuna in the ginger and soy sauce for a good 20 minutes. Sear for a minute or 2 each side (for well done for 4 minute each side). Place the greens on the plate. This time, the tuna steak turned out to be well-done, as Greg liked it this way… I would have preferred medium or rare, but oh well. Everything else is pretty straight forward. One important thing: the cooking time of quail eggs. Two and a half minutes: yolk is perfectly runny. Three minutes: will turn into a medium boiled egg.